St. Louis is the home of T.S. Eliot, Marianne Moore, Kate Chopin, Tennessee Williams and Howard Nemerov. It is not surprising that St. Louis has nurtured so many great literary figures because the city had had a commitment to literacy and literature since its founding. 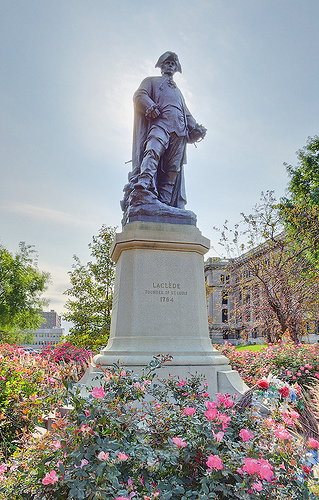 Although the father of St. Louis, Pierre Laclède, intended the new city purely as a headquarters for trade – it wouldn’t even have a church for eleven years – reading, books and literature were important to him. Not only Laclede but also his common law wife, Marie Therese Chouteau, was able to read. This was remarkable at a time when the literacy was calculated upon the ability to write one’s name. Moreover, the literacy rate in 18th century France, their native land, was only 29 to 48 percent for men and a mere 14 to 27 percent for women (depending upon whether you lived in the countryside or Paris). Perhaps because they took their fate into their own hands, the people of the New World placed great value on the power of the written word. Literacy rates were higher here in the 18th century than in the Old World: 60 to 70 percent in the British Colonies versus 48 to 60 percent in England. The founder of St. Louis took great pride in his library, and it marked him as a gentleman. The inventory of Laclède’s estate included some 200 volumes. At a time when a book cost nearly as much as a common laborer earned in a week, such a library denoted great wealth as well as a lifestyle that placed value on reading. Mme. Marie Thérèse Chouteau was a liberated woman before such a concept existed. She called herself widow although her husband was not dead. Even though she bore Laclède four children, she chose not to marry him when her husband did die because Laclède was in debt at the time. A business and social leader in St. Louis, she was aided in her success by the nuns in New Orleans who had educated her. Being able to read was a noteworthy achievement for a woman of the time. Auguste must have admired his step-father in turn for he followed him in loving books. Indeed, Chouteau bought the first eight books in his library from Laclede’s estate. When he died, Chouteau’s library numbered 600 volumes. Fascinating information about Saint Louis’ founding family. Great blog post!